Present online this Heavenly Dreams from the Heart Combo Collection for your loving dears and make them smile. 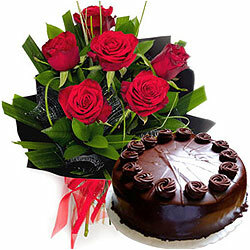 This undeniably stunning Gift is a collection of Chocolate Cake and 6 Red Roses Hand Bunch. Present online this Heavenly Dreams from the Heart Combo Collection for your loving dears and make them smile. This undeniably stunning Gift is a collection of 1 Kg Chocolate Cake and 6 Red Roses Hand Bunch.